Historically, the underestimation of pain severity post-craniotomy has limited opioid use due to concerns over clouding the postoperative neurologic examination. More recent data has refuted that belief and revealed that moderate to severe pain exists in about two thirds of patients. 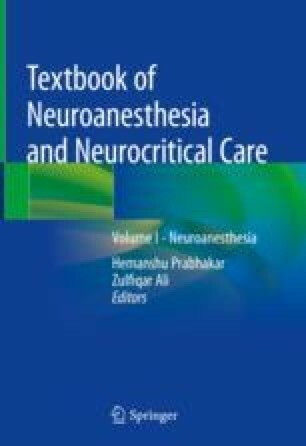 The presence of pain leads to sympathetic stimulation, which is a risk factor for the development of postoperative complications including intracranial hemorrhage, underscoring the need for adequate management. Although opioids are the mainstay of management of postoperative pain, the utilization of analgesics that target alternate receptors and pathways has become prominent. Review of literature on scalp blockade and pin site infiltration reveals a large body of fairly convincing evidence, but the timing and ideal injectate could be better defined. Although preliminary, recent data on dexmedetomidine is promising and supports a potential opioid-sparing effect. Utilization of nonsteroidal anti-inflammatory drugs, gabapentinoids, intravenous lidocaine, tramadol, acetaminophen, and ketamine, may have roles, but additional data are required.